This study on the Holy Spirit In The Now comes out of my personal experience and over 30 years of prayer and study of the Word. It was through the generosity of my good friend, the late J. Arthur Rank, outstanding British businessman, member of the Parliament, and Methodist layman, that the Oral Roberts University’s first endowed academic chair on the Holy Spirt was established in the fall of 1972. Because of his great interest in the Holy Spirit, Lord Rank determined to establish this chair at ORU. However, on the day he was to sign the papers, he passed away. The trustees of his estate honored his desire and set aside a generous sum for the next 5 years for this purpose, with the stipulation that they decided then if they wish to continue this as an annual endowment to endow the chair. I am honored to be the first professor of this course on the Holy Spirit. 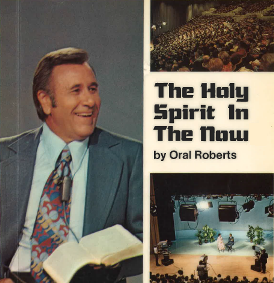 Roberts, Oral, "Holy Spirit in the Now - II" (1974). Holy Spirit In the Now. 9.